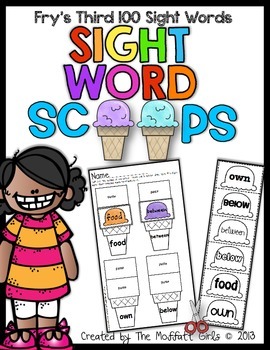 Sight Word Scoops (Fry's Third 100 Sight Words) are a FUN and hands-on way to master and reinforce ALL of the Fry's Third 100 sight words! 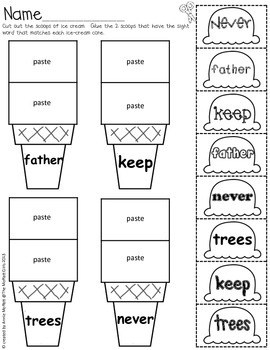 Kids get to color, cut and paste the correct sight word ice-cream scoop onto the correct cone. How FUN is that? The ice-cream scoops incorporate a variety of fonts so that students can learn to recognize and read words in different printing and published styles. high, every, near, add, food, between, own, below, country, plants, last, school, father, keep, trees, never, started, city, earth, eyes, light, thought, head, under, story, saw, left, don't, few, while, along, might, close, something, seemed, next, hard, open, example, beginning, life, always, those, both, paper, together, got, group, often, run, important, until, children, side, feet, car, miles, night, walked, white, sea, began, grow, took, river, four, carry, state, once, book, hear, stop, without, second, later, miss, idea, enough, eat, face, watch, far, Indians, really, almost, let, above, girl, sometimes, mountains, cut, young talk, soon, list, song, being, leave, family, and it's. 3. 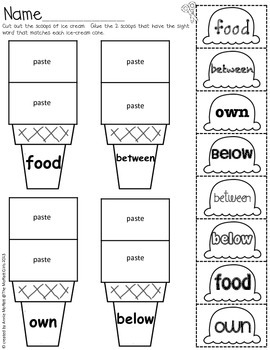 Know and apply grade-level phonics and words analysis skills in decoding words. c. Read common high-frequency words by sight (e.g., the, of, to, you, she, my, is are, do, does). Be sure to visit The Moffatt Girls blog for more educational resources and ideas!